2018 has been a good year. My husband and I did some traveling, I published my first book, I’m back working part-time at a job a love, a job that gives me the flexibility to pay my bill and gives me time to write my next novel and market my current book. I feel very proud of all of my yearly achievements. I’m excited for the upcoming year. I definitely have some new goals this year including writing my next novel. Last year, I created a vision board checklist which was really helpful to keep all my goals organized. I truly believe when you put something out in the universe you are more than likely to achieve your goals, dreams, or aspirations. No matter what you wish to achieve, write it down. Trust me, it works. 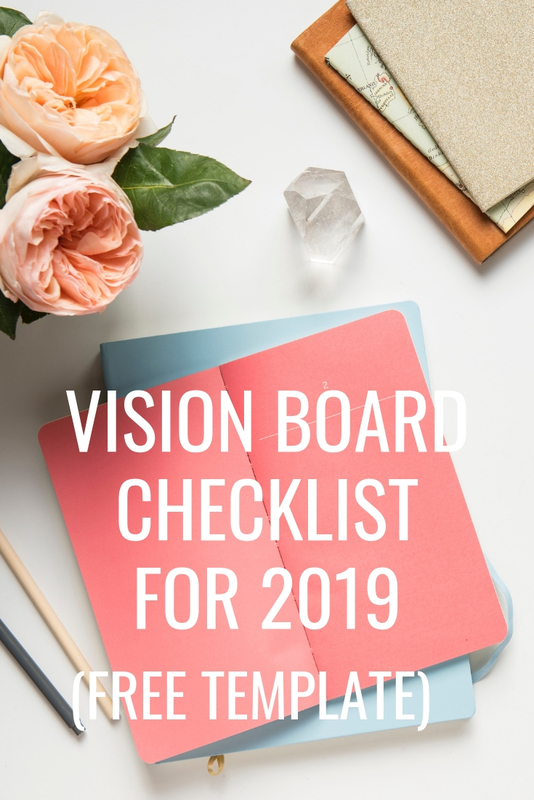 If you need some help to get started, you can download and save my Free Vision Board Checklist for 2019. I created it for my other blog, Girl’s Guide Chicago. Whether your goal for the new year is writing your own first novel, or just getting your life organized for the New Year, this checklist is really helpful. I can’t wait to share with you all about my new novel, my writing process, and I will also share my writing tips. If you are in Chicago, I also hope to do some more book signings and even a few girl’s nights. A Girl’s Guide to Chicago is Launched and Published, So What’s Next? When I started writing my novel, A Girl’s Guide to Chicago, I never knew how the book would turn out, if I would finish, it or let alone even published it. Writing a novel is something I’ve always wanted to accomplish. Now that I have written my first novel it has definitely sparked something in me. I’m so proud of all the hard work I put into this book and I truly LOVED the whole process. I decided to self-publish this novel for a few reasons. First, because my novel is very niche, being focused on Chicago, and second, because I do really enjoy the challenge of marketing my book. I want to learn everything I can about marketing my first book. But let me tell you, it’s hard work. A very different kind of hard work than the time, creativity, character building, plot development, chapter flow, sentence structure, basically all the things that make a great novel. Marketing a novel is summed up as, as much as you LOVE your own book, trying to get others to see your book the same way is very difficult. It’s not impossible. However, I’m figuring out every possible way to be creative while also continuing to research daily about all the different ways I can get my book out there. I’m not afraid to admit that I’ve already made some mistakes and definitely would do some things differently next time. But that’s okay! It’s a learning process and going forward I now know what to do and what not do. With that being said, now that I have written, A Girl’s Guide to Chicago, I’m very excited to start the process again. I’m currently working on an outline for my next novel. Yay! But, my next novel will not be about Chicago. Currently, most of my book marketing is focused around my blog, girlsguidechicago.com, which works perfectly hand in hand because the two are very closely related. However, since my next novel is not based in Chicago and I want to also focus more on all things writing, sharing my future novel updates, press, etc, I thought I needed a proper author website. On this blog and on my newsletter, I will share updates on, what I’m working on, sneak peeks at my newest novel, exclusive book giveaways for my readers, exclusive invites to my events (mostly in Chicago for now), favorite books I’ve read lately, and more. I hope you are as excited to follow along on my journey as I am to continue it. I’m a true believer in following your dreams and passions. When you work hard and put in the effort, dreams do come true. Oh and I just got an email today that my book has been selected to partake a Cover of the Month contest for September. Yay! If you can take just a second, you can vote for my cover. Just click on this LINK and click on the orange anonymous vote button.